Niles North hosted the final Pizza Wars on Thursday, Jan. 19 to benefit the Niles Township Education Foundation, which provides funds for D219 students who have school-related costs they are unable to pay. The event, which has become an annual staple in Niles Township, also included raffles and an auction to benefit the Education Foundation, with the assistance of Dance Marathon. Local pizza businesses including Lou Malnati’s and Jets Pizza were featured, with attendees voting for their favorite thick and thin pizzas. The Education Foundation is a charitable organization that is active throughout District 219 and seeks to “enrich education for Niles Township High School students by providing additional resources,” according to their website. 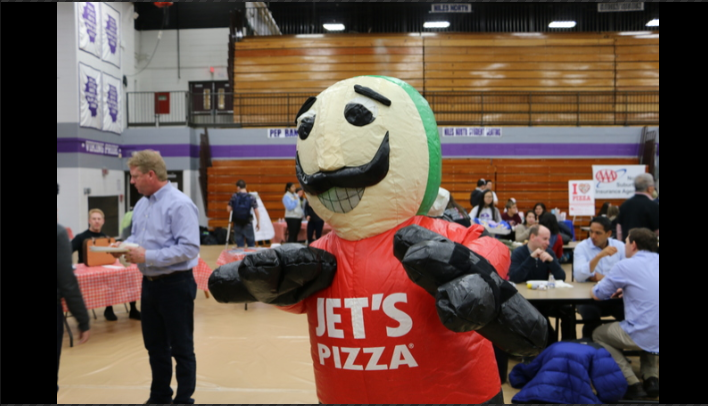 Students and community members from both Niles North and Niles West participated in Pizza Wars, thanks to the event’s ability to combine fun and pizza eating with an important cause. Many of the local businesses participating also place a strong emphasis on supporting and interacting with their communities. Even several District 219 administrators made the trip to Pizza Wars, including the superintendent and several board of education members, to show their support for the Education Foundation and speak its praises. “It’s extremely important that the district participates in and partners with the Education Foundation because the foundation provides funds for things that the district might not be able to for students in all of our buildings. Because of that, we certainly appreciate all of the work and the fundraising that they do,” Niles Township superintendent Steven Isoye said. Isoye also highlighted the importance of community interaction surrounding the high schools that Pizza Wars helps facilitate. In the end, Lou Malnati’s won the Chicago-style deep dish contest, while Skokie favorite Village Inn took home the prize for thin crust. However, the true winners were all those who were able to support the Education Foundation’s worthy cause. Donations to the foundation can be made here.